This section will basically concentrate on Jay's guitars, amps, studio work and recording issues and related areas of interest. As most of you already know, JAY GRAYDON is twice Grammy awarded with 12 top five Grammy finalist nominations, among them are for instance the winning R&B songs AFTER THE LOVE HAS GONE and TURN YOUR LOVE AROUND and Grammy top five finalist nominations for e.g. the prestigious title "Producer of the Year" as well as "Best Engineered Recording". WELCOME TO GARDEN RAKE STUDIOS! This is it, my friends! This is where all the MAGIC happens! As many of you surely recall, Jay wrote a fabulous series of articles on recording techniques exclusively for guitar.com a while back, titled RECORDING THE GUITAR, which was filled with tons of information. When guitar.com did a relaunch of the website a few years back, they apparently decided not to incorporate the material into their revamped site, so these 32 articles are now removed. At this point Jay needs to focus on the upcoming second JaR album, but after the release he will be able get down to writing new and updated articles on modern recording techniques, which we will probably compile into in an e-book later on. More on that when the time comes. Apart from the above mentioned article series on recording the guitar, Jay has shared his expertise in all things recording with us in an article written for EQ Magazine. 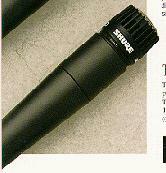 The article in EQ Magazine deals with Recording Acoustic Drums. Please note that this article is also included in the print version of the September issue 2006 of EQ Magazine. Over the years Jay has written a lot of articles and tutorials on various subjects, and continues to do so on an irregular basis. Most of these articles and tutorials have their home here and you are welcome to take part of loads of comprehensive information from one of the highest ranked guitarists, producers, engineers and more, in the music industry. 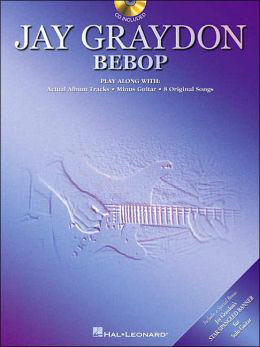 In the Japanese music magazine "ADLIB" (covering Adult Contemporary Music, Jazz, R&B...) a while back, Jay Graydon was voted the second favorite guitarist in the world by the readers. Yea, as you can see he is in great musical company surrounded by the world's best guitarists of all time. The Japanese people have always had good taste in music! Jay's profound knowledge of recording, engineering, songwriting, arranging, producing and related areas, has rendered him deep respect within the music industry and he has been called in as a beta tester of music gear a number of times by leading music equipment developers. Jay's music expertise comes from a deep well of experience - recording sessions from his career over the years and a desire to share his know-how with everyone who is seeking knowledge on how to develop his/her skills within the quality recording area. All great producers and great studios must have great recording stuff, right? For many years Jay used these Alesis ADATS. The ADATS days are over as Jay is now using PRO TOOLS HD3 as his recorder format, which he uses in conjunction with his NEVE V2 console. Before digging into the studio set up and the guitars, here is a pic of the famous gig bag from Jay's session days. Just click on it to get a bigger pic. 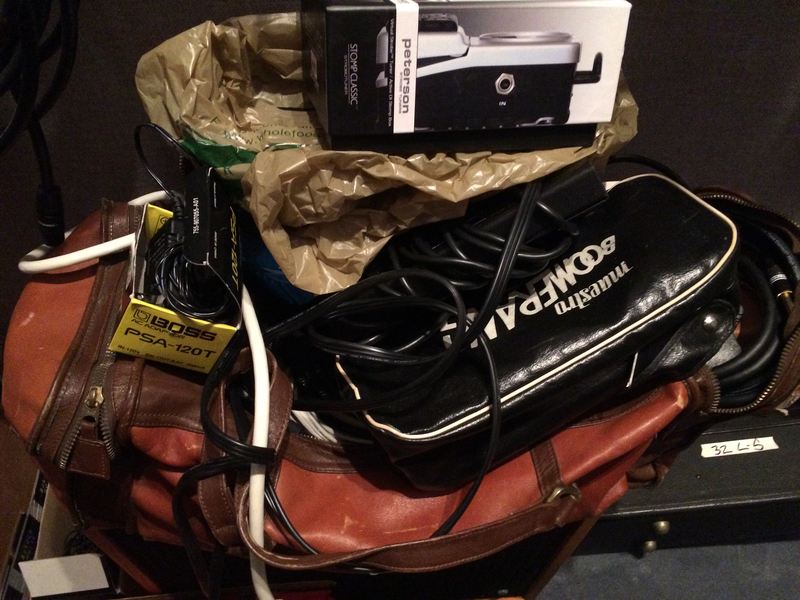 When I was doing sessions full time I had a gig bag with gear I had collected for years. The bag was stolen from the cartage company truck while the guys were in the studio setting up my amp. Not sure of the year so I will guess mid to late 70's. Bad news since some of the stuff was hard to replace. For the next few days I had to run around, test many effects to pick out the best ones. I called Paul Rivera to make many different length guitar cables, adapters, etc. I had small screw driver sets and went to a hardware store as to replace. The replacement tools were not as good as the stolen stuff. Over time I replaced everything and was bummed out that the stuff was not quite as good. Oh well. Over the years when I found better tools and gear I added to the new gig bag. The pic you are seeing has gear piled on top. If I ever do live again in LA I will reorganize. I also put together a gig bag for my Cambria house as I played jazz gigs in Cambria and SLO (San Luis Obispo - 40 minutes from Cambria). That gig bag has slightly less stuff, but enough for such gigs. Here below are some more photos on Jay's gear over the years in Garden Rake Studios. For comments and larger versions just click on the images. For recording guitar Jay uses a Massenburg eq and a Massenburg limiter. Here are some of the guitars that Jay has used over the years and is still using for different projects. For a larger version plus Jay's comments click on the image. Jay's latest addition to his guitar collection - a classic jazz guitar - a vintage Gibson L5 1932. Jay, when you started out as a young musician did you know from the start that this was it? "I want to become a studio musician!" or was it the thrill of performing to a live audience that was driving you? When I first started playing the guitar, I knew that my life would be in music. When going to college, I found out what a studio musician was and this became my goal. One of the musicians in our Valley College "big band", Ray Jackson, did a lot of arranging for R&B records. He liked my playing and this was the start of my studio career. My years in the studio would read like a novel. Looking back, playing in the studios was so much fun! What is your advice to young guitarists who are hoping to get into the studios? If you get a chance to play in the studios, act professional. Do not try to impress the other players by playing your "hip licks" between takes. This interrupts the flow of the session. Do not ask stupid questions like if the chart had a "C major 7th chord" on the first bar, and the rest of the band was obviously playing a C7, don't try to impress the leader by asking time wasting questions. Just change the mistake on your part and move on. If the chart is a rhythm chart (nothing written out), listen to the song or demo and try to find a part that is complementary to the song and does not get in the way meaning do not overplay. Listen to the "groove" and fall into the "pocket" of the drummer. Play "in tune" and strive for a good tone. So much more to offer on this subject but one last thought. A player usually gets one chance to be a studio player so practice and be prepared. Learn to play all the styles of music that you might come across. Learn to read music! Now tell me how do you create that special warm sustaining kind of "hanging" tone of your guitar? Do you use any effect gadgets to achieve this? "My sustaining warm tone" is most fun. The key is that the guitar and amp must like each other which they do. It is easier to get "consistent sustain" in the studio on solos because the amp speakers are isolated in another room. I can crank up the amp as high as I want without "screech" feedback from the pickups. Playing live is more difficult since every night is in a different venue and has different acoustics. I learn each venue meaning that I will move the guitar at different angles to control the feedback in a friendly manor. This is not always that easy to do. The volume pedal is the key to controlling unwanted "screech". I use a Vintage Orange Squeezer" and an Ernie Ball volume pedal. That is all that goes to the amp. In the studio, I add an Eventide Harmonizer (set to .005) and a delay line set to 45 milliseconds from buss sends off the console amp signal and blend in with the straight guitar. 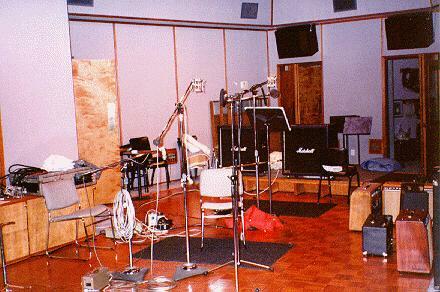 Sometimes I may use a short room reverb to tape as well. I also compress the amp with a GML Limiter but only a few DB of compression on "peaks" so the sound will not get too "squashed". One more thought on this. If you have a compressor in the "guitar amp loop", this is not good in my book since the compressor will "brick wall" the guitar signal. As you increase the guitar gain to the amp, it will not get louder and will just get smaller and "squashed". The Orange Squeezer in front of the amp only compresses the guitar and not the overall volume. DESCRIPTION: Juicer: A hand made Dan Armstrong™ Orange Squeezer clone (orange box). As most of you know, I have been using an Orange Squeezer compressor for many years. I have tested many stomp box compressors over the years and to date, the Squeezer is still the best. Obviously, the original version has not been manufactured for quite some time. Some vital data and a few reviews on the Juicer. NEW VERSION of the AMAZING SLOWDOWNER Available! The AMAZING SLOW DOWNER is a tool that every musician must have! We have all performed "take downs", written out solos, etc. Before I discovered this tool, when trying to note complicated lines, chord changes loaded with extensions, etc., I would rewind the cassette tape, CD (whatever format) many times as to figure out the musical information. Those days are over as the AMAZING SLOW DOWNER allows the user to slow down the CD to a speed that makes blazing up tempo 16th notes sound like whole notes! No annoying data seem glitches in the process! Further, you can tune to any key! And apart from slowing down CDs, the program is also capable of slowing down MP3 and AIFF (Mac) / Wave (Windows) files. All written material, images, photos, video, and audio, in all sections of this website copyright Jay Graydon/Kerstin Olofsson (KEO) 1996 - 2019. All rights reserved.